tsbox is built around a set of converters, which convert time series stored as ts, xts, data.frame, data.table or tibble to each other. 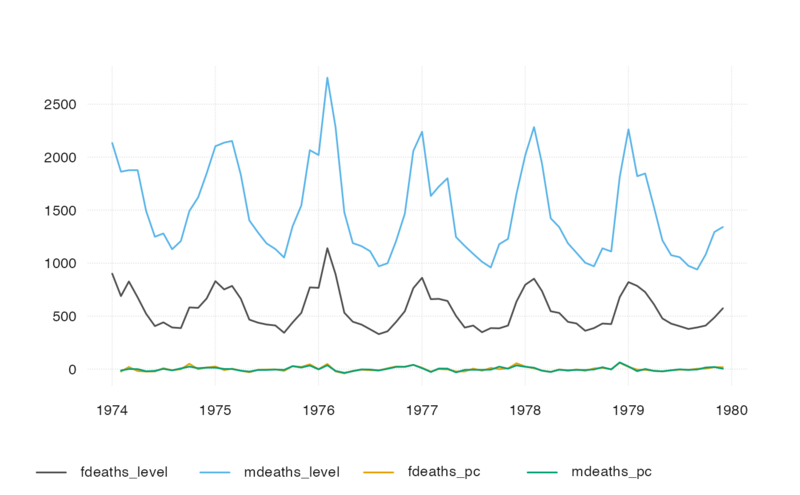 ts-boxable time series of the desired class, an object of class ts, xts, data.frame, data.table, or tibble. Starting on the right, the first first numeric or integer column is used as value column. Using the remaining columns, and starting on the right again, the first Date, POSIXct, numeric or character column is used as time column. character strings are parsed by anytime::anytime(). The time stamp, time, indicates the beginning of a period. All remaining columns are id columns. Each unique combination of id columns points to a time series. Alternatively, the time column and the value column to be explicitly named as time and value. If explicit names are used, the column order will be ignored. Whenever possible, tsbox relies on heuristic time conversion. When a monthly "ts" time series, e.g., AirPassengers, is converted to a data frame, each time stamp (of class "Date") is the first day of the month. In most circumstances, this reflects the actual meaning of the data stored in a "ts" object. Technically, of course, this is not correct: "ts" objects divide time in period of equal length, while in reality, February is shorter than January. Heuristic conversion is done for frequencies of 0.1 (decades), 1 (years), 4 (quarters) and 12 (month). For other frequencies, e.g. 260, of EuStockMarkets, tsbox uses exact time conversion. The year is divided into 260 equally long units, and time stamp of a period will be a point in time (of class "POSIXct").